To put it simply, Marty Friedman is an anomaly within the musical world. He started off in the 1980s as a very-young guitar-centric recording artist for Shrapnel Records, the California-based label which had also signed his metal band- Cacophony. The start of the 1990s brought Friedman into the Megadeth fold, in which he would go on to sell millions of albums. Yet nowadays, Marty Friedman is arguably more famous than ever before, internationally renowned as not only a virtuoso guitarist, but also as a writer, author, television personality and all-around authority on music. Friedman moved to Japan in 2003 and quickly found work as a sideman for a variety of Japanese prominent recording artists. While he still plays live and in the studio with other artists – his credits include top-sellers Momoiro Clover Z and Ayumi Hamasaki — Friedman himself is a prominent solo artist with more than a dozen albums to speak of. In addition, as an in-demand host and actor, to date Friedman reportedly has over 700 television credits. However, the guitar hero chooses not to rest of the laurels of his stardom within Asia, instead challenging himself with full-fledged European and American tours every year or so for the past few years. The latest full-length release from Friedman is ONE BAD M.F. Live! !, which is due for an October 19 release via Prosthetic Records. ONE BAD M.F. Live!! is a recording of a concert Friedman performed in Mexico in April 2018 with backing from Kiyoshi (bass), Jordan Ziff (guitar), and Chargeeee (drums); Ziff is currently on the road with the band Ratt. Specific to the Sportskeeda scope, Friedman has played guitar at many major sporting events over the years. This not only includes the Tokyo Marathon and an assortment of MLB and NFL events, but also Wrestle Kingdom 8 for New Japan Pro-Wrestling. As a Japan Heritage ambassador, Friedman was one of the select people chosen to visit cities involved with the 2020 Tokyo Olympics and Paralympics. I had the pleasure of speaking with Marty Friedman on behalf of Sportskeeda, and highlights of such are below. More information on all things related to the guitar legend can be found online at www.martyfriedman.com. You have been part of many sporting events as a musician. Do you remember the first one? Marty Friedman: It wasn't a sporting event per se, but at one of my very first shows as a kid in Maryland, the boxing champ Sugar Ray Leonard showed up to support us. I have no idea why, as he was at the peak of his game at that point, and we were just a new teenage rock band. What was the last sporting event you attended for fun? Or not as a performer? Marty Friedman: The last time I went to a game without performing was a Philadelphia Eagles exhibition game and it was awesome. Usually when you play the anthem or something like that you leave right away and don't wind up watching the game, which is always a shame. What was it like performing at a New Japan Pro-Wrestling show? How much rehearsal was needed? Marty Friedman: It was fantastic, because [Hiroshi] Tanahashi is truly a lover of guitar and he was genuinely excited to do something with me. We talked way more than I thought we would and I wound up really admiring his craft, as I could get a little glimpse of what goes into it. It is really an intense amount of power that he summons up. I actually don't remember the rehearsal, which means it was probably just a very short soundcheck to make sure my guitar was live in the house. The Tokyo Dome was wall to wall people and it was very exciting to rock out with Tanahashi. Did you play any sports as a kid? Or was music always your #1 hobby? Marty Friedman: I was WAY more into sports than music. I played football, baseball and basketball, but was too small and skinny to compete with the bigger kids. I was decent for my size, but that means precious little. If you remember The Bad News Bears, I was definitely Ogilvie, the one who knew everyone's stats and averages, but was no threat at the plate. Did moving to Japan change your perspective on sports? Marty Friedman: It made me miss football more, as it is not a topic ever, but I do love Japanese "Koshien" which is the high school baseball tournament. It's a huge deal in Japan, always broadcast on TV, pre-empting everything else. I can't imagine the amount of girlfriends these guys have, being in high school, but also being baseball heroes. Must be awesome! Were you ever asked to sing the national anthem at a sporting event? Marty Friedman: Thankfully not to sing, but I have played it on guitar many times. Most recently in 2016 at Angel Stadium in Anaheim, California for the MotoCross championship. More importantly, when was the last time you sang in public? Marty Friedman: I sing one song in my concerts every night. You can hear that song on my new live album, ONE BAD M.F. Live! Depending on your point of view, it may or may not be the high point of the album! 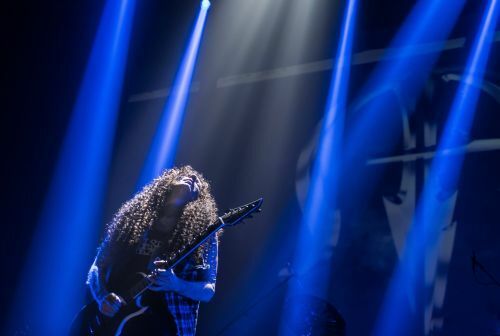 Career-wise, what do the next few months look like for Marty Friedman? Marty Friedman: Touring! A record release concert on October 21 at the Viper Room in Los Angeles, and then a full blown Asia/USA/Europe tour starting in November and going through May. Hope to see you there! Finally, is there anywhere you haven't yet played live that you're still hoping to tour? Marty Friedman: I've never played in India or Egypt -- I would be thrilled to do shows there.